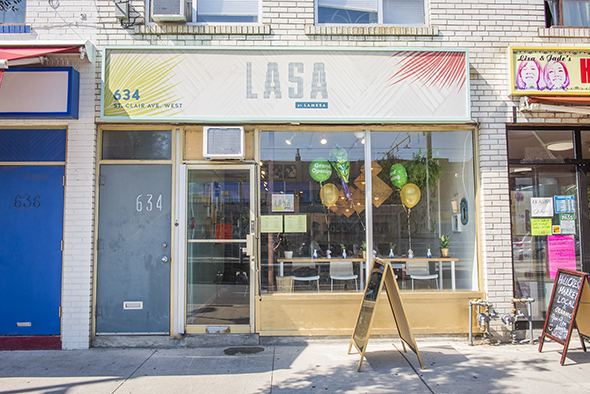 Lasa by Lamesa is a casual Filipino restaurant on St. Clair West right next door to Sea Witch . 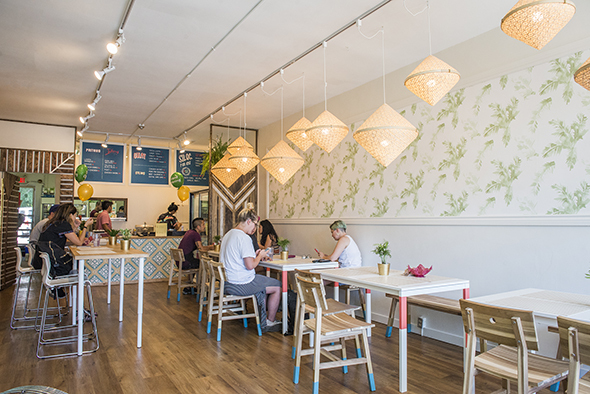 It's an extension of Lamesa on Queen St. West, though they serve downtowners a more upscale, deconstructed, delicate version of Filipino. Owner Les Sabilano is excited to make Filipino accessible to Torontonians in a more traditional style. Lasa means flavour or taste. This means the dishes here are based on the foundations of Filipino cuisine including sharing plates and eating with your hands. There are really only a few dishes that are even intended for one. Their menu is broken up into four sections with English translations and a glossary. The categories are pritong (fried), inihaw (grilled), gulay (veggies), and stews. The interior is cheerful and inviting with big windows at the front with bar seating, and light, spare lunch tables and chairs throughout. Expect lots of bright tropical colours and a flair for thrifted knick-knacks that both give the place personality and pay playful homage to the surrounding Salvation Army and Goodwill thrift stores. So beware, some spoons are decorative. We start with the lechon kawali, which is crispy fried pork belly ($10). 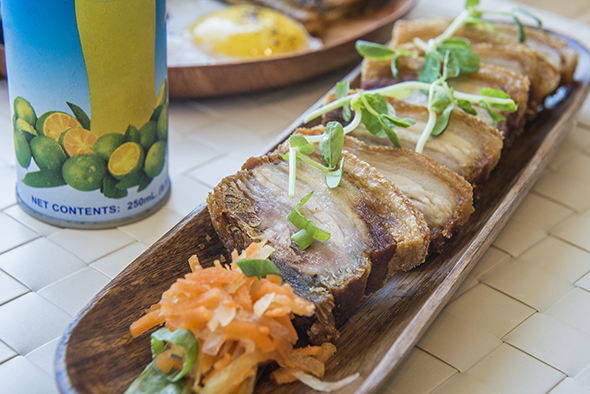 It's a Filipino classic that comes in a portion size of six thick slices of pork belly, and comes served with a small clump of pickled papaya and carrot slaw and a dipping sauce of soy, vinegar, garlic, chili, and onion. Next we grab something from the veggie menu, the ginataan. It's $10 with hearty chunks of squash, bok choy, and plump green beans in a coconut miso broth, or $14 if you add shrimp. 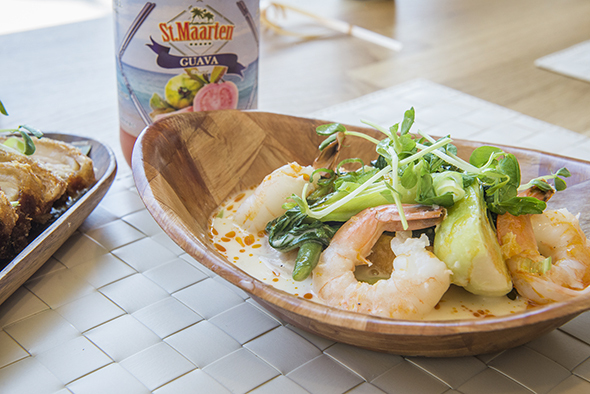 The veggies sprinkled with droplets of a red annatto oil which shows off Spain's influence on this Filipino dish and topped with microgreens will satisfy any vegetarian, but the shrimp is superb. 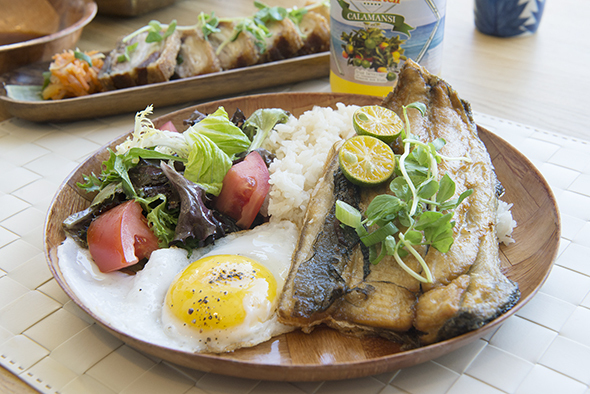 We also try that one dish meant for one, the silog ($12), a combo meal served with garlic rice and a duck egg. You can get it with your choice of bangus (milkfish), BBQ skewers, fried chicken, or tofu. We go for the first option, the national fish of the Phillippines, deboned, marinated, and then fried. It's topped with the tiny citrus fruit calamansi, which is kind of like a miniature lemon. Lastly we try Lasa's halo-halo ($5). They're doing theirs in eccentric bowls from Chinatown, and the recipe comes straight from Les's dad. 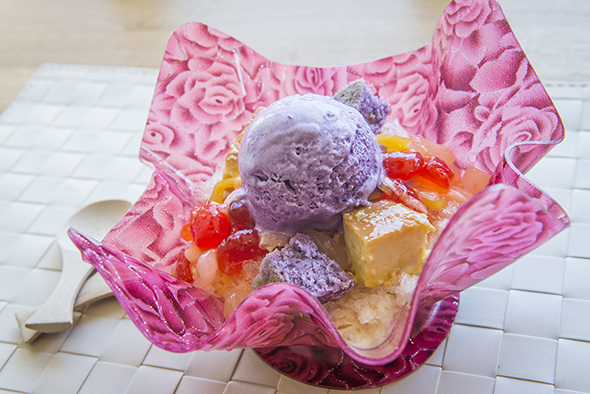 The condensed milk and shaved ice base is topped with cubes of leche flan and coconut jellies, then an ube (or taro) ice cream.